This guy was feeling pretty secure in the piling he was standing, as a result of which, I was able to — slowly and carefully — get pretty close. A lot closer than I usually get. 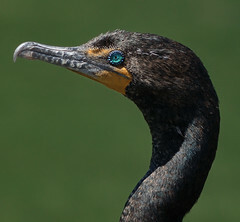 I have historically had much difficulty in really getting a clear shot of a cormorant’s eye — which frankly looks less like a bird’s eye and more like the eye of some Egyptian deity. Because their eyes are so awesome, and I have so few shots were the awesomeness comes through, I was excited about the prospect of getting a really good shot of the face and eye, and I went ahead and shot 100-150 shots in the space of maybe twenty or thirty minutes, which (together with what I’d shot before that) filled up the card. During that whole time, this guy was pretty much looking around, looking at me, looking at the water, checking for his buddies, and then looking at me again. Not to entertaining. Nonetheless, I pounded away on the shutter, trying to ensure that I would get a shot with a sharp, clear image of the eye. 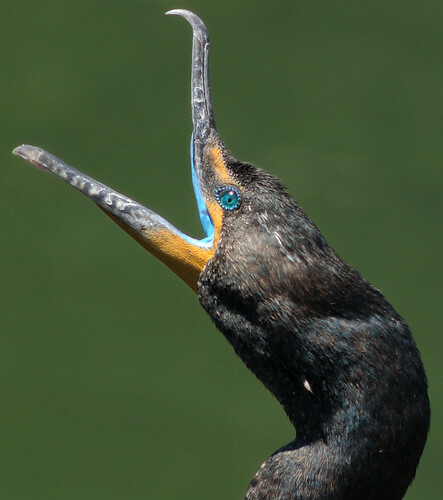 Then, when I was literally on the last shot left on the card, he suddenly broke into this enormous yawn, revealing the surreal color of the inside of his mouth.